Vidal Construction provides a variety of roof replacement options for steep and low slope applications. Focal points are energy savings, manufacturer's extended warranties, best practice installation, code compliance, and safe work practices. We have worked on the insurance side of numerous claim evaluations and assist with avoiding confusion and expediting the re-roofing process. Composition Shingles. Composition shingles are a widely used roofing cover and offer great value at reasonable pricing. We are an Owens Corning Preferred Contractor and offer a wide variety of shingle options. With our manufacturer-backed warranty, you can rest easy knowing you have extra coverage. Tile roofs. Tile roofs are offered with an elevated batten system providing for passage of heat. Metal Roofing. Standing seam Galvalume roof systems are offered which have been proven to be energy-efficient and long-lasting. Coatings. We offer Elastomeric coatings extending the life of your aging metal roof panels at a 60 percent savings of replacement cost. Metal Decking. We proudly offer the installation of metal decking and re-decking services, mechanically fastened or welded with varying gauges and finishes. Insulation Board. Insulation is a critical component of a roof's thermal performance. We proudly offer the installation of rigid foam board insulation (Polyisocyanurate) on flat roofs prior to the installation of TPO. ISO board offers the highest R-value per inch, significant energy savings, low water absorption, and resistance to compression. Single-Ply Roofing. We proudly offer Single-Ply TPO (Thermoplastic Polyolefin) roofing systems which exceed energy code requirements and offer proven savings. Once installed, TPO becomes a hassle-free single sheet of waterproofing that provides a reflecting blanket of protection. Green Roofing. Each roofing application has varying degrees of green value and we explain the advantages of appropriate materials and proper installation techniques. Siding. James Hardie Siding Products are proudly offered and installed per manufacturer's guidelines with a 30-year limited warranty. Gutters. These are often addressed during a roof replacement. We offer seamless, leaf-proof, aluminum gutters in a variety of colors. What Does Haag Certification Tell You About Us? This is why Haag Certification is so important. Haag Certified Inspectors are not beginners in the field. They are adjusters, estimators, home inspectors, roofing contractors, consultants, and other industry pros who have fine-tuned their inspection skills to find damage where it exists. Students must maintain active status as Certified Inspectors by requalifying through testing on an annual basis. 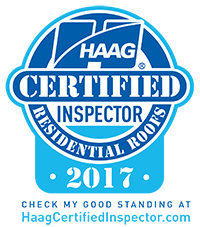 Simply put: Haag Certified Inspectors are tested professionals who possess the resources to assess damage with confidence. Check out our personal Haag Certified Inspector profile at HaagCertifiedInspector.com today!